Bunk beds come in a variety of designs, colors and materials, and are among the most popular beds for kids. This type of bed can be a great option when space is limited or when multiple children share the same room. However, safety must also be a factor with any type of furniture used in a child's room. Bunk beds can made from wood that is stained or painted and they can also be made from metal. Totally Kids Fun Furniture and Toys- This site has a large selection of wood and metal frame bunk beds for both boys and girls, with customizable color options on some models. Simply Bunk Beds- Here you will find many styles and colors of wood and metal frame beds. Two free mattresses are offered on most styles, including futons. Rooms To Go Kids- Here you can find both metal and wood bunk beds and loft beds that can be purchased individually or combined with matching bedroom furniture. 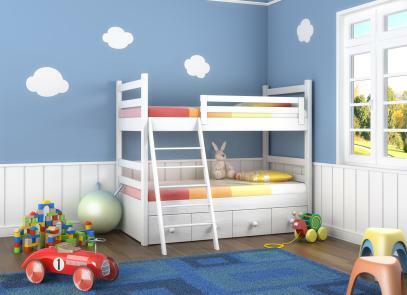 Maine Bunk Beds- This is a family owned business that offers handmade solid wood bunk beds that have environmentally friendly and non-toxic paint finishes. It is also worthwhile to check Overstock.com. If you do find a bed you like at Overstock, you should buy it quickly, as items move fast. Bunk beds are a great way to decorate a small bedroom. By using vertical space, parents are able to utilize the rest of the room. This is especially useful in situations where siblings share a bedroom. Instead of filling valuable floor space with multiple beds, parents can utilize the space over a bed. 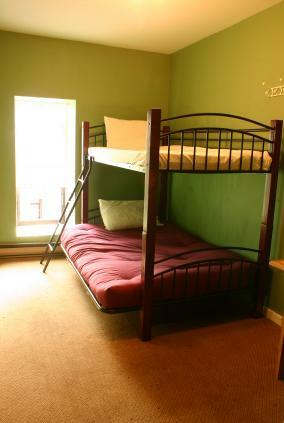 Bunk beds or loft beds are also popular choices for college students. Dorms are notoriously small, and these beds make efficient use of the space. Bunk beds are also useful for children who frequently have overnight guests. Instead of making pallets on the floor or using sleeping bads, guests can simply use one part of the bunk. Many bunk beds also feature a trundle bed, a pull-out bed that is stored under the bottom bunk. With a bunk bed and a trundle, even the smallest bedroom can comfortably sleep several children. Despite their practicality, bunk beds are not without risks. Children have been known to roll off of the top bunk. For this reason, bunks are not appropriate for children who sleep walk or have other sleep disturbances. Children under age six should never sleep on a top bunk. 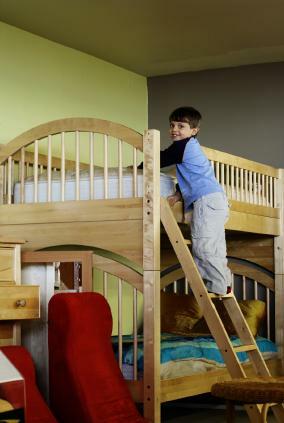 Regardless of the children's ages, all bunk beds must have safety rails on each side. Make sure that the rails are sufficiently high to prevent accidental falls. If the bed is not sturdy enough, the top bunk can collapse. This, too, can cause serious injury or even death. It is vitally important that all assembly instructions are closely followed. You should also check the bed periodically, to make sure that all screws are tightened and that the structure is stable. Also make sure the ladder is properly attached. Children also enjoy jumping and rough-housing on bunk beds. This can lead to serious injury. All children must be taught the proper use of the bed. Use common sense with bunk beds. Buy this type of bed for older children or about five years old and up. Set some strict ground rules for the kids such as no rough housing, fighting, pushing or jumping off the top. With a little cooperation and respect for the furniture, bunk beds can be a great option for your kids' bedroom.